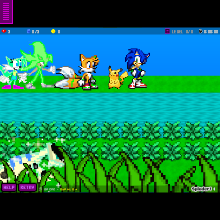 Sonic encounters Eggman trying to capture the Shiny Raptor and Stops him then after a short time Deatheron Appeared! Making Shadow illusions of the legendary beasts. Then Sonic has to fight Deatheron once more.